In Brief: Head up to the craggy peak of the big mountain behind Nine-Eyes Tower at Jiankou, and then down into the wild valleys and hills on the other side. 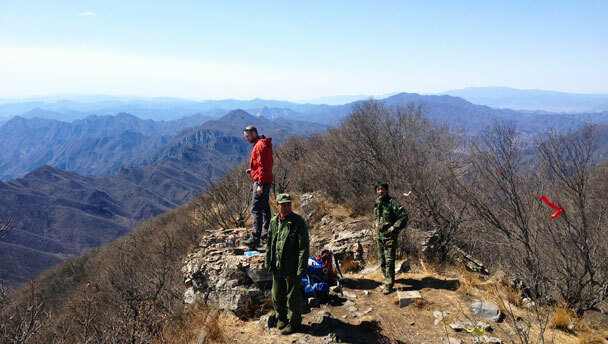 Hikers on the peak of Heituo Mountain. 6–7 hours over around 18km. Head up the craggy peak of the big mountain behind Nine-Eyes Tower at Jiankou, and then down into the wild valleys and hills on the other side. Finish the hike with a big slog up to a ridgeline before walking down and out to a small village. This is a fairly rough hike and part of the track is rather wild, so we’re limiting the number of participants to only fifteen tough trekkers. From the top we’ll take a steep and narrow hill trail down into the valleys on the other side of the mountain. The path takes us right around the back of the mountain, down through fallow terraces full of dead leaves. From this point we’ll keep the group fairly close together as the trail becomes overgrown and faint, with many little forks and turns. We’ll work our way up on to a low ridge, and then make an arduous climb that will get us back up on to the main ridge that comes down the north side of Heituo Mountain. We’ll follow the trail down the forested ridgeline before meeting the concrete road that will take us down to the end. Time to complete: est. 6–7 hours.